The Giant Guardsmen are a perfect piece of fun. With their extra tallness (rather large hats) they really stand out in a crowd. 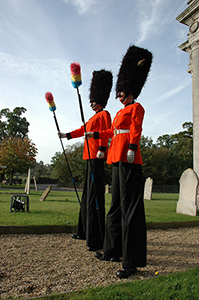 The Guardsmen march and perform drills, which involves cleaning up the public with feather dusters on the end of extra long poles. They were a hit on French TV when they performed a salute by presenting arms to the President, then at the last second polished the bald head of the Mayor of Bordeaux. These eco birds (made from recycled materials) are a highly interactive and unruly flock! They’re on the hunt for food, so are partial to a chase and a little peck here and there! 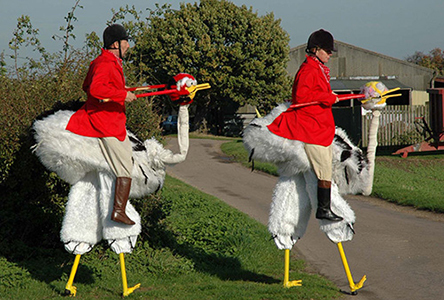 The Lemmings Ostriches were one of the first stilt illusions in the UK and twenty odd years later they can be found almost everywhere – a real tribute to their success. Recently, a group of our birds, complete with ostrich trainers, took to the racetrack for Lord March at Goodwood Races. This is one of our double act wonders – it’s extraordinary! 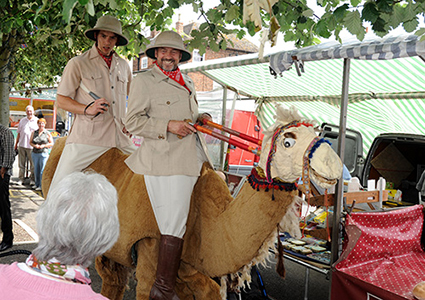 We have 2 camel riders riding a life-size camel! It’s our most interactive, engaging and enthralling stilt illusion, with people often asking ‘Does it have an engine?’ This takes great skill as two performers are joined together, trotting in unison and questioning how they’ve come so far from the desert! 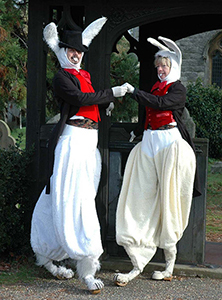 Our bunny rabbits are a bouncing illusion straight out of the pages of Alice in Wonderland. Using bouncing stilts, they’re quick, lively, interactive and boppy! These cheeky bunny rabbit are happy to go anywhere and talk to anyone. British Bobbies were performed by the Lemmings in 1984 and have since travelled the world, keeping the peace and checking for suspicious behaviour everywhere they go! 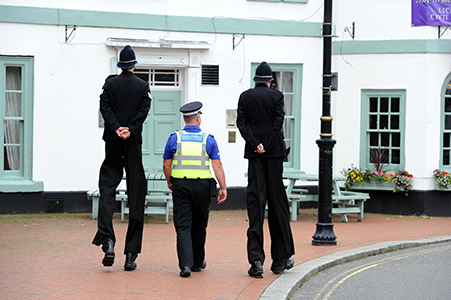 The long leg of the law (as they’re often known as) is one of our most popular and enduring stilt acts. 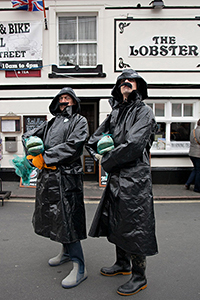 Looking for some seaside fun and silliness? Look no further! 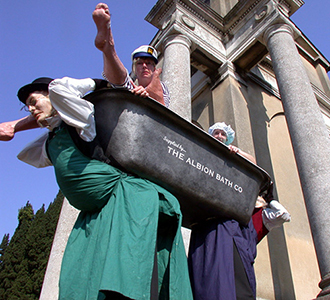 The two old butlers appear to be carrying a bath of water containing a couple of fun-loving aristocrats who are armed with a shower and water pistol to keep them and the audience dry on those hot summer days. It’s Nautical naughtiness! Deep sea fishermen dripping with water and displaying their latest catch of horribly real cod! The cod perform terrible sea shanties and cheesy fish jokes, bringing delight to all those who stumble upon them. It’s pure nautical nonsense and not on stilts for a change. Did you know that if you pat a unicorns nose and make a wish then it will come true? 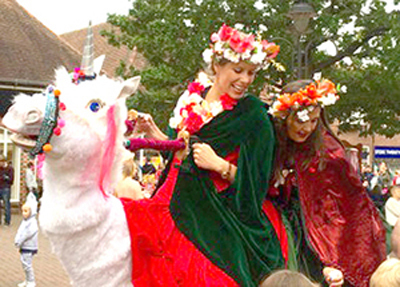 Just one little magical fact about unicorns that these 2 woodland fairies share with the audience. Don't forget to collect some magic fairy dust too...! This act is one for small children and adults alike! 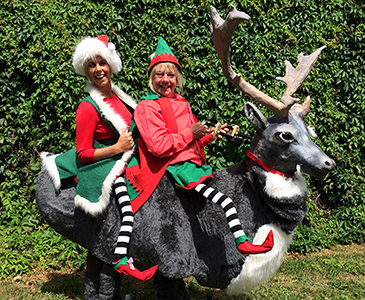 Two little lost elves riding one of Santa’s reindeer who seem to be looking for the way back to Lapland! Offering seasons greeting, getting up to mischief and trying to spot Santa in the crowd is just part of this amazing stilt illusion! Visually stunning and always funny! 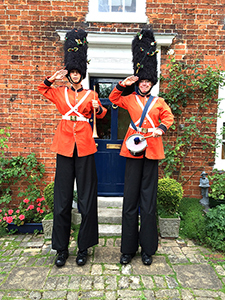 A right Royal welcome from our Toy Soldiers. They’ve escaped from the Christmas Toy Box and are cleaning up the crowds in time for Christmas. They are ready for some seasonal fun…are you? Complete with fairy lights and robins nesting in their bearskin hats! 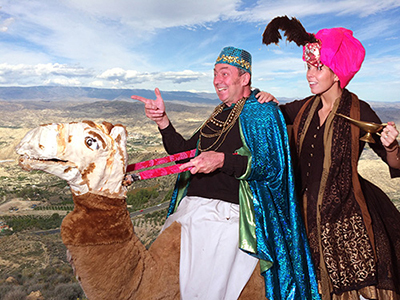 Well two wise men up on a camel and another one leading them towards the kingdom on wisdom! They can provide answers to all problems known to man (except the lottery numbers!) Bringing frankincense and myrrh they really are the wisest of the wise.